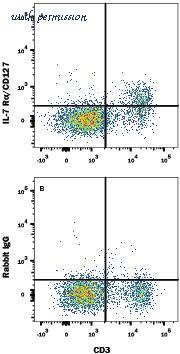 Detection of IL-7 R alpha/CD127 in Mouse Splenoctyes by Flow Cytometry. Mouse splenoctyes were stained with Rat Anti-Mouse CD3 APC-conjugated Monoclonal Antibody (Catalog # FAB4841A ) and either (A) Rabbit Anti-Mouse IL-7 R alpha/CD127 Alexa Fluor« 488-conjugated Monoclonal Antibody (Catalog # FAB7473G) or (B) Normal Rabbit IgG Alexa Fluor 488 Control (Catalog # IC105G ). View our protocol for Staining Membrane-associated Proteins . Detection of IL-7 R alpha/CD127 in Mouse Splenoctyes by Flow Cytometry. 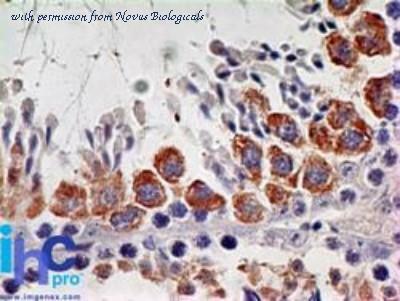 Mouse splenocytes were stained with Rat Anti-Mouse CD3 PE-conjugated Monoclonal Antibody (Catalog # FAB4841P ) and either (A) Rabbit Anti-Mouse IL-7 R alpha/CD127 Alexa Fluor« 647-conjugated Monoclonal Antibody (Catalog # FAB7473R) or (B) Normal Rabbit IgG Alexa Fluor 647 Control. View our protocol for Staining Membrane-associated Proteins . Anti-IL-7 Receptor antibody IHC of human colon, MALT. Immunohistochemistry of formalin-fixed, paraffin-embedded tissue after heat-induced antigen retrieval. Antibody concentration 5 ug/ml. IL7R antibody (2 ug/ml) staining of NIH3T3 lysate (35 ug protein/ml in RIPA buffer). Primary incubation was 1 hour. Detected by chemiluminescence. Western blot of recombinant IL7R / CD127. This image was taken for the unconjugated form of this product. Other forms have not been tested. Western Blot: IL-7 R alpha/CD127 Antibody (73N8F2) [NBP2-25249] - Analysis using Azide Free version of NBP2-25249. A) IL-17R recombinant protein fragment and B) mouse thymus lysate using this antibody at 2 ug/ml. Immunohistochemistry-Paraffin: IL-7 R alpha/CD127 Antibody (73N8F2) [NBP2-25249] - Formalin-fixed, paraffin-embedded mouse testis stained with IL-7R antibody at 5 ug/ml. 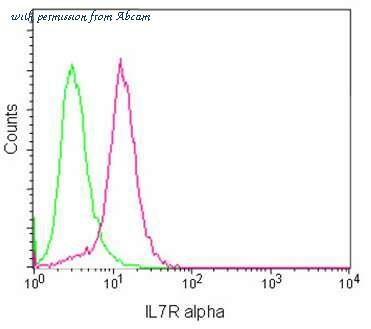 Western Blot: IL-7 R alpha/CD127 Antibody (73N8F2) [NBP2-25249] - Analysis of A) IL-17R recombinant protein fragment and B) mouse thymus lysate using IL-7R antibody at 2 ug/ml. Immunohistochemistry-Paraffin: IL-7 R alpha/CD127 Antibody (73N8F2) - Azide Free [NBP2-25264] - Formalin-fixed, paraffin-embedded mouse testis stained with this antibody at 5 ug/ml. Western Blot: IL-7 R alpha/CD127 Antibody (73N8F2) - Azide Free [NBP2-25264] - Western blot analysis of A) IL-17R recombinant protein fragment and B) mouse thymus lysate using this antibody at 2 ug/ml. Western Blot and immunoprecipitation of Rabbit anti- IL-7-Receptor-alpha-chain-pY449 antibody. Lane 1: thymocyte D1 cells. 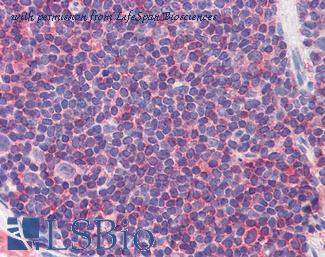 Lane 2: thymocyte D1 cells treated with IL7 (50 ng/ml). IP: with anti-Phosphotyrosine conjugated to Protein G agarose. 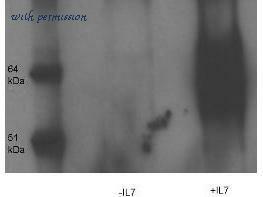 Primary antibody: IL7pY449 antibody at 1:10000 for overnight at 4°C. 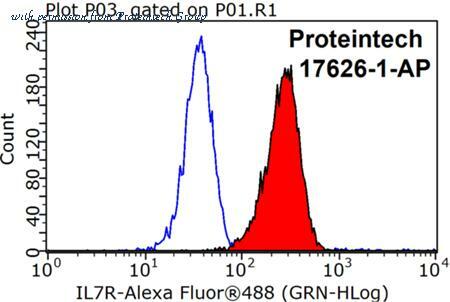 Secondary antibody: HRP-conjugated goat anti-rabbit antibody at 1:10,000 for 45 min at RT and ECL detection. Block: 5% BLOTTO overnight at 4°C. Predicted/Observed size: 55 kDa, ~64 kDa for IL7pY449. Other band(s): unspecifics. 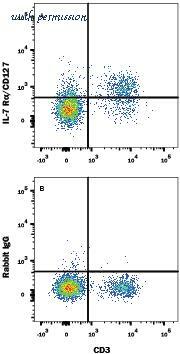 Dot Blot of Rabbit anti-IL-7 Receptor antibody. 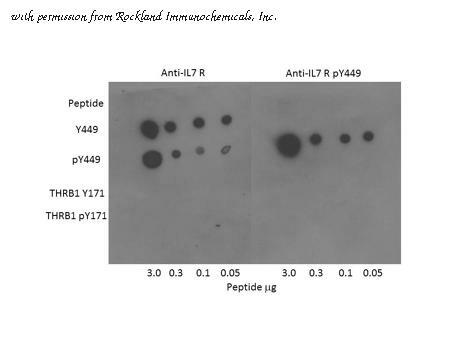 Antigen: IL-7 Receptor and IL-7 Receptor pY449 forms of the immunizing peptide and THRB1 and THRB1 pY171 as controls. Load: 3.0, 0.3, 0.1, 0.05 µg as indicated. Primary antibody: IL-7 Receptor antibody at 1:400 for 45 min at 4°C. Secondary antibody: Dylight™488 rabbit secondary antibody at 1:10,000 for 45 min at RT. Block: 5% BLOTTO overnight at 4°C. 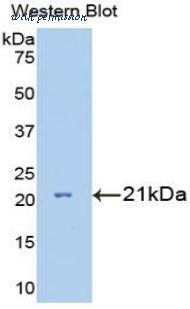 The CD127/IL7R antibody from Proteintech is a rabbit polyclonal antibody to a recombinant protein of human CD127/IL7R. This antibody recognizes human, mouse antigen. The CD127/IL7R antibody has been validated for the following applications: ELISA, WB, FC, IP analysis.